It’s clearly not an issue to perform praying in public spaces in Indonesia. Schools, offices, karaoke places, even gas stations provided a ‘dedicated’ space for Muslims to do the praying. , Unfortunately, it’s not applicable somewhere else, where Muslims is minority. Couple days ago, I had a meeting at Medical School. It was nearly 1.30pm, and I just have another 30 minutes before the next class, which taken place at Boyd Orr Building, just across the road. Therefore, that was the prefect time to do Dzuhur (a prayer at noon). Luckily, a friend of mine, a medical student, was accompany me to a ‘praying space’ at Medical School. It was not literally a praying space. It was a tiny space at the end of the stairs, on the top of that building (4th floor) – on the picture above. There are some praying mats and veils ‘provided’ by Muslim students who study medicine and hanging there. Apparently, today, I almost missed Magribh praying. I went to Interfaith Praying Room at the Main Building and found that the door has been locked. So, here we go, I made my way to The Library, climbed up to the 9th floor, and praying among the ‘french literature’ bookshelf. The library used to have praying space at 9th floor. But it has been 2 months that the refurbishment project affect that ‘room’. 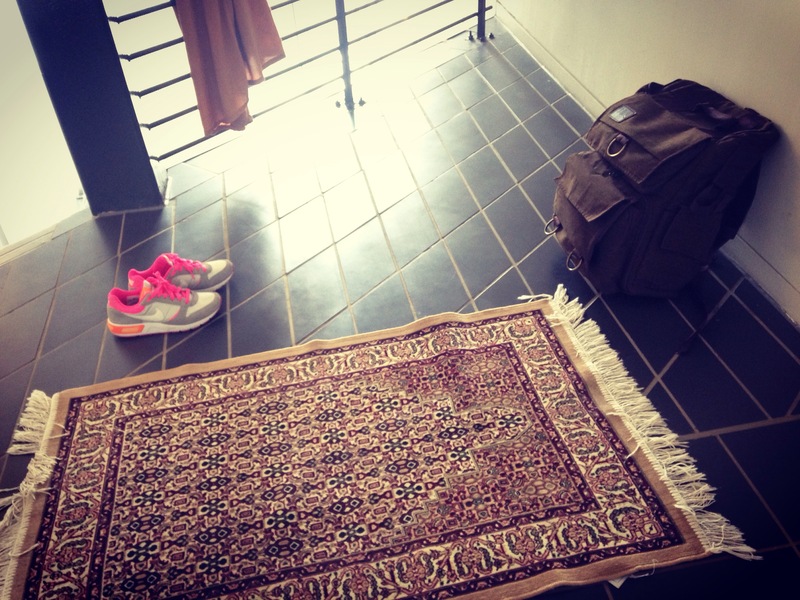 Suddenly, we found our praying mats and veils being moved outside the ‘room’. It has been several times Me and Muslim friends ‘adapting’ with this situation. Either finding any ’emergency place’ for praying (e.g. Among the bookshelf at the library) or do the praying later at home (Jama’ or Qashar). I personally raised my concern about this and talked to few people and sent an email to the university. But the response was dissapointing. They said that the university has provided interfaith praying space, which can be use inclusively by students from any religion including Muslims. The case is, only Muslims perform the praying 5 times a day. Moreover, IF our friends from one religious organisation have booked the room, others (including Muslims) cannot have access. That’s it. We have already done our best. I appreciate Daniel and Eliz from PPI Greater Glasgow who are Catholics but fully supported me when I raised this concern. I also appreciate GUMSA that has been calling for ‘a proper’ praying facility since a long time ago (someone says since 1999). In conclusion, I personally find this in 2 ways. (1) There will be some ‘obstacles’ to stand to what we belief. And I believe I’ll have a ‘reward’ from it. (2) when I get back to Indonesia, I should put more empathy to others from different etnicity and religion, since I considered to be ‘majority’ in my country. What goes around comes around, in a positive way :). Okik, just like in local movies that have stories about Indonesians who studied aboard. Unfortunately, it happens to you. Well, being minority amongst majority is something precious for me. Attended study in public high school: granted a permission to ‘leave my class’ during Muslim class hours and attended Catholic class (after school, whilst the Muslims had Friday prayer) by ANTHROPOLOGY teacher who is a Catholic. Moreover, I think I was the only Chinese who studied there. But, I’m sure, just like you, “There will be some ‘obstacles’ to stand to what we belief. And I believe I’ll have a ‘reward’ from it”. Salah satu proses, biar aing bisa mengerti, merasakan, dan bersikap toleran terhadap segala perbedaan yang ada di planet biru ini.